Powerful link organizer to manage 100's (or 1000's) of websites links: take control of your internet! Want to store a few bookmarks? Use your browser! Want to take control of your Internet information? Use Rons WebLynx. 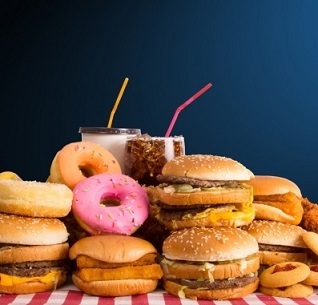 "This product is in an early stage of development! We have set a 90 day time limit on each version of this product, to ensure that our customers keep up to date with the latest, most reliable, version and prevent early, less reliable, versions from remaining available. Please contact us with any issues and ideas. Our products are built for our customers." 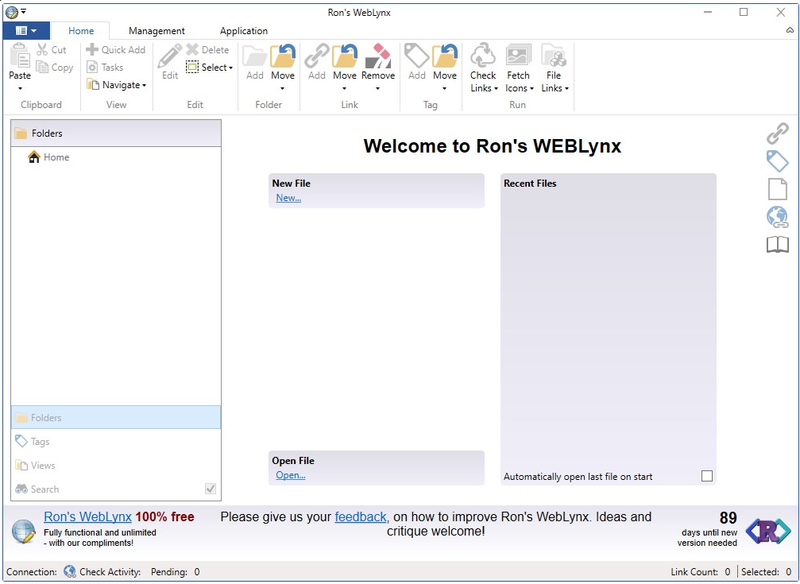 Ideal for research, marketing, or just organizing a lot of links, Rons WebLynx is a powerful application to manage and view website information. Rons WebLynx is ideal to store all your links efficiently. Just drag and drop your links into the application! Or import links from pretty much anywhere including Outlook, word documents and even entire websites. The links can be easily viewed thanks to the integrated web browser and the content-only view Panel. Add notes, tag your links with names and color and rate your favorite bookmarks. Integrated search and filtering capabilities make it a breeze to find your links quickly. 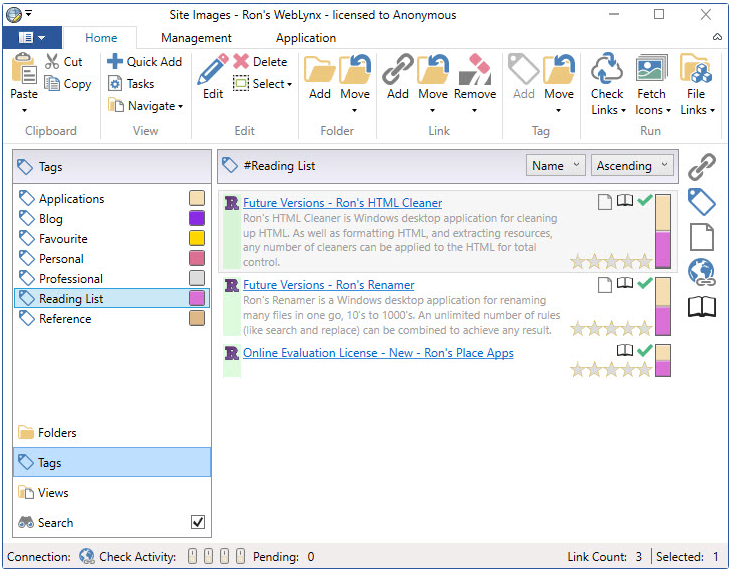 In short, WebLynx is an application that not only stores and organizes links but also allows to make the most of them. A great tool for anyone who uses the Internet! All this power is presented with a clean and neat interface that is a pleasure to use. Stop drowning in browser tabs, and focus your attention!. Give it a try! 1000's of links handled effortlessly, automatically checked, and filed (when configured). Make web page information clear and easily accessible in many ways. Import, paste, drag and drop links from almost anywhere. Check Links Check links automatically or manually to check of links are still active or broken or errored. Tag Links Tag links with name and color. Rate Links Rate the links by highlighting up to 5 stars. Add Notes Add comments and Notes to saved links in the Note Side Panel. 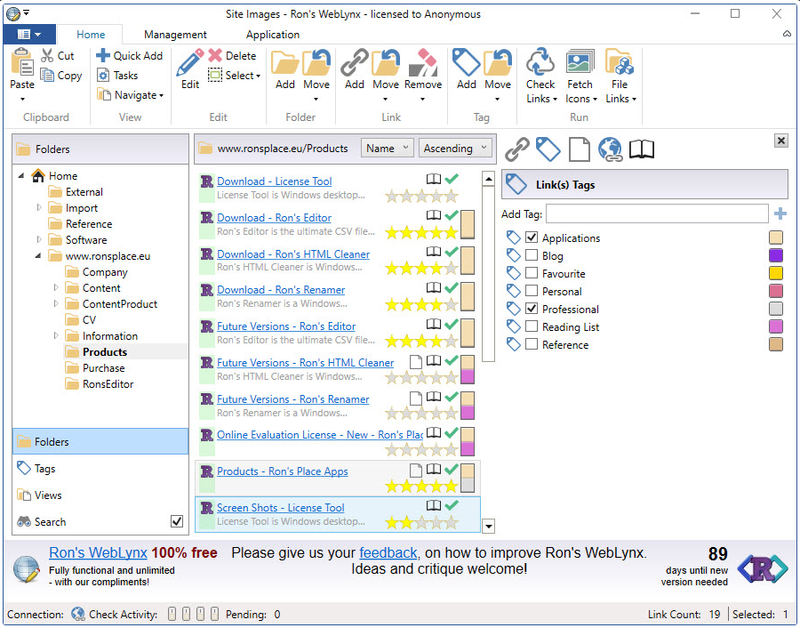 Filter Filter any link view using key words, tags or ratings and links state. 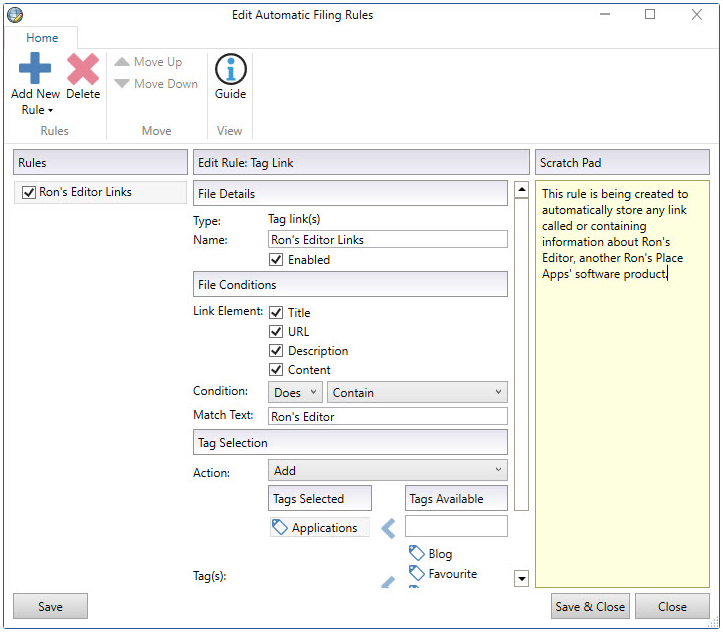 Use the Quick Add panel or simply drag and drop one or more links at the same time. Export Export in HTML, XML, Linker Exchange or Content formats to File or Clipboard. Page Icons Get link icons automatically or manually. Reading View View the content of link page without unnecessary clutter. Browser View View the website page within WebLynx. 231 761 Rons Place Software <img src="https://www.oldergeeks.com/downloads/gallery/thumbs/RonsWeblynx1_th.png"border="0"> Feb 25, 2019 - 12:30 2019.02.23.1135 2.23MB EXE , out of 1 Votes.